Be transported back to a time when Steam haulage was the rage in this spectacular hour long DVD, packed with both nostalgic and breathtaking scenes. 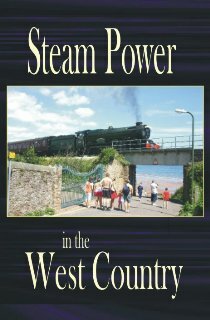 Filmed throughout 1997 & 1998, this includes steam footage at Penzance, Okehampton, and the Newquay and Falmouth branches in Cornwall. On the preserved scene we visit the Bodmin & Wenford, South Devon Railway, Swanage, Paignton & Dartmouth and the narrow gauge railway at Launceston for their steam gala. Locos featured on this programme are; 1369, 1450, 1501, 3205, 4555, 4561, 4920, 5239, 6024, 6412, 6435, 7029, 7325, 7760, 7821, 7828, 30053, 30828, 34027, 34072, 41708, 42968, 45110, 48773, 68011, 73096, 80104.